Most healthy people do not need supplements, although many turn to them as a quick fix for poor eating habits. Frequent pill-popping can have negative side effects.  Off-the-shelf health supplements can plug nutritional holes for some, but experts advise caution. Most healthy people do not need supplements, although many turn to them as a quick fix for poor eating habits. This is not necessarily a bad thing, say the experts. Even so, they warn that frequent pill-popping can have negative side effects. These include kidney or liver problems, vomiting and diarrhoea. Despite that, supplements are flying off the shelves more than before. Market research firm Euromonitor said in a November report that Singaporeans are spending more on vitamins and health supplements. Consumers here forked out US$374.4 million (S$494 million) on these products last year, it found. This was US$30 million more than what was spent in 2012. Popular products include probiotics, fish oil, glucosamine for joints, and co-enzyme Q10, which is said to help lower one’s cholesterol levels. The firm attributed this trend to Singaporeans’ busy urban lifestyles, which can leave little room for regular exercise and a balanced diet. “Many Singaporeans do not have time to stay physically active, and often indulge in meals that are unbalanced in terms of nutrition,” said Ms Yvonne Wong, a research analyst at Euromonitor International. The habit of eating out frequently is also another issue. Six in 10 Singaporeans eat out at least four times a week, according to the 2010 National Nutrition Survey. 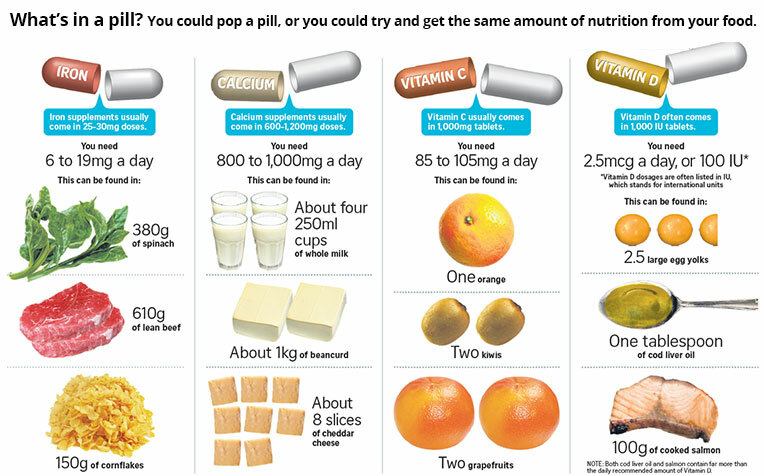 For those with such nutritional holes to plug, vitamins and supplements are an easy solution. But too much can be bad for you. This is especially the case with fat-soluble vitamins, say the experts, including vitamins A, D, E and K. As the name suggests, these dissolve in fats and therefore take a longer time to pass out of the body. But she added that it is also possible to overdose on certain water-soluble vitamins, such as vitamin B6. Too much of this vitamin can lead to nerve problems that cause pain and numbness in the hands and feet. People with pre-existing health conditions should be careful when taking stimulant drinks, such as Red Bull or 5-Hour Energy shots. They often contain caffeine, which can be risky for people with heart problems, for example. “The stimulants can potentially worsen anxiety in anxious patients,” pointed out Dr Derek Koh, who heads Thomson Wellth Clinic @ Novena. When it comes to buying off-theshelf supplements, senior pharmacist Serena Koh advises caution, as these products are not regulated by the Health Sciences Authority. “Individuals need to be mindful to purchase their supplements from trusted sources and be vigilant in evaluating claims made by supplement vendors,” said Ms Koh, who works at the Singapore General Hospital. As a general rule, many factors affect how long it takes for a supplement’s benefits to kick in, added Ms Koh. In one research paper published in 2005, scientists studied people taking 1,500mg of oral glucosamine every day. The supplement is supposed to help with joint health. They found that it took at least two weeks to reduce joint pain and increase a person’s mobility. While most reputable supplements are “very safe” for consumption, Dr Li said, those with chronic health problems or allergies should pay extra attention to what they are eating. If a healthy person plans his meals carefully and gets regular exercise, he might not need supplements at all, said Dr Li. He added that one possible exception could be vitamin D, which is normally obtained through exposure to sunlight. “One might expect that this should not be a problem living in Singapore,” he said. What are some of the red flags to look out for when buying health supplements? Here is what the Health Sciences Authority (HSA) suggests to help you decide if products are reputable. Do not be suckered by supplements that promise “quick cures” or “easy solutions”. Sometimes, health supplements take effect quickly because they contain potent, undeclared ingredients, which can cause health problems. For example, several consumers experienced rapid pain relief after they consumed a product known as Herbal Health Jointcare. The HSA found that the product contained potent ingredients, including a steroid. Over the long term, unsupervised steroid use can result in a variety of health problems, including diabetes and high blood pressure. Be wary of dubious marketing claims that are not easily verified. These include personal testimonies, complex-sounding scientific terms and statements such as “used safely by millions” or “all-natural ingredients”. For example, one diet product was marketed as containing natural ingredients. However, a teenager suffered hallucinations and was hospitalised after consuming it for more than a month. It turned out that the product contained sibutramine, a substance that has been banned in Singapore since 2010. Always buy from a reputable store or pharmacy. Advertisements for these products also do not have to be approved by the authority. What the HSA typically does is to sample products already on the market. It also relies on doctors’ reports of negative side effects from health supplements before it initiates product recalls.